George Chaffey, of Mildura and Renmark fame, first bought land here in the 1890s as the possible site for an irrigation project. But the height of the river cliffs, using the pumping equipment of the day, was the drawback to the project. It was not until 1918 that the mallee country was first opened up to 770 ex-servicemen under the Soldier Settlement Scheme. These tenacious settlers survived in harsh conditions and fluctuating world markets to develop a dried fruit industry. Today a massive irrigation project supplies over 400 megalitres to 5000 hectares of grapevines mainly grown for dried fruit. The district also supports the largest winery in the southern hemisphere, the Lindemans Karadoc Winery, 11 km from town. South-west of Red Cliffs is the eastern boundary of the huge Murray-Sunset National Park. Calder Highway, Red Cliffs. This massive traction engine is the largest ever built in Australia. So large and so slow that it took over two years (1917-1919) to make the journey from Melbourne to the Red Cliffs area. It weighs over 45 tons, is 34 feet long, 11 feet wide and 18 feet high. 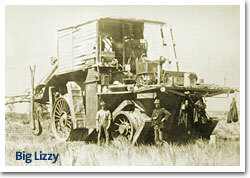 It was powered by a 60 horse-power single cylinder Blackstone crude oil engine weighing 8 tons. The turning circle was something to marvel at; it took 200 feet radius to turn it around. It towed two massive trailers, each with their own water and oil reserve tanks, and had an overall carrying capacity of 80 tons. To spread the load and stop Big Lizzie from sinking into the the sand, platforms made of iron were attached to the wheels with hinges and cables. This novel idea was an invention of an Australian, Frank Bottrill, and was used frequently in the sandy soils of the Mallee. Big Lizzie worked for five years clearing mallee scrub in the Red Cliffs area then was moved south to Glen-dinning Station near Balmoral in western Victoria. There it remained for 40 years until rescued and returned to Red Cliffs. Here the cliffs take on a rich red colour and make strong reflections in the still waters of the Murray. The lookout is situated in Pumps Road near the entrance to the Red Cliffs pumping station. The cliffs are sign-posted from the Calder Highway. Approximately 4 km from Red Cliffs. It is small (21 hectares) but diverse. Aboriginal middens, numerous birds and the site of the old Carwarp pump boiler are found. Boardwalks and viewing areas are provided. Restoration of the old engine that ran between the railway siding and the pumping station is underway. The restored engine will run as an tourist attraction on land next to the Calder Highway about 1 km south of Red Cliffs. Turn off the Calder Highway 2 km south of Red Cliffs at Karadoc signpost. The winery is 9 km from the turnoff. Established in the 1840s the winery has grown to be one of the largest in the southern hemisphere. The facility is ultra modern and handles over 50 000 tonnes of grapes each year. Wine is made and matured at Karadoc, but is shipped in bulk tankers to Sydney for final blending and bottling. The tour around the winery is well worth taking. Cellar door sales: Mon-Fri 9am-5pm, Sat 10am-4.30pm, closed Sun. Ask at cellar door for tours.